I’m leaving out of here to drive down Bent Mountain (in the all-to-familiar fog) to meet some folks that have asked me to be a part of what seems on this side of the meeting-to-know-more as a good thing to be involved with. I’m generally not an organizational kind of guy, but have been surprised at the joy involved in working with SustainFloyd this past year and a half. Maybe there are sides to me I’m still discovering? Maybe you’ve run across the imaginative, meticulous, numerically-oriented photographic works of Chris Jordan. But have you really SEEN them? Click each image more than once. Go farther and farther into the picture. And farther into a relationship with the issues each reveals in the emulsion of your conscience. These images are not trivial gimmicks but true and valid “object lessons” about matters of consumption and health that matter. Or should. Somehow this seems related. I had a conversation yesterday with someone I was getting to know. He spoke of an unearthly experience in the dessert that was for him a peak moment. I could tell it meant a great deal to him, that the sensory experience changed him, but he could not find the words to reproduce the experience in my mind. I understand. Images can help us understand where words fail. Jordan’s photographs offer this translation that might move us closer to comprehension. And from time to time, a writer, too, will find the words that translate our own experiences into sentences we can share. There is, at least, that hope. The clouds would not relent. They insisted I drive home the longest way necessary to feature them in a photograph yesterday afternoon, with or without the competing fall colors, as long as they got feature focus. And of course, I was guiding them into place as much as they were demanding I stop at that place and take some glamor shots. The finest specimens were south, as I headed north towards home. So I had no choice but to follow where the sky lead me. And in so doing, as fate would have it, on a road I’ve taken a few times, I discovered an old cemetery I’d never noticed in those passings. Almost all of the gravestones were old. The most distant birth date I could make out on the weathered stones was in the late 1700s. Many markers consisted simply of upturned rocks–probably marking the graves of slaves. None were massive and pretentious. Some–like the one in the foreground here–were wonderfully overtaken by lichen. This one, one of the largest grave stones, was festooned in a halloween-orange covering, which drew my eye. Why, then, have I chosen instead to render this in black and white? Click image for larger view. The colors were super-saturated–a true Kodachrome afternoon. But the color threatens to overwhelm the message of the image. They are both pleasant. But I’m moving more and more to monochrome these days. I’ll have a few more cemetery shots in the coming week, and from farther along my afternoon detour, some landscapes where the polarizing filter really did a number on a sky already a deep cerulean blue. So I hope, wherever these particular low, fast-moving specimens have gone, that they approve of their portrait here, and I appreciate them complying with my requests to float perfectly positioned in this composition. It’s a mutualistic relationship I enjoy as a cloud whisperer. For me, with the onset of cooler weather, and after the brain-fuzz of summer, I feel the urge to NOT do what I’ve always done. However, what changes to make depends on the different destination and consequences one wants, I suppose. I had quite a few opportunities yesterday at the Land Trust event to speak with folks from Tech, Blacksburg and Christiansburg, Giles county, Galax and elsewhere about the possibility of speaking to groups in those places. Bouncing ideas off other folks is helpful–you see your own reflection in ways that solitary brainstorming will not show you. In some cases, tomorrow’s efforts would involve doing what I’ve always done–for a much wider audience, I hope. In other cases, I’d like to get–and offer–something different. While I’ve been incorporating the photography more and more into what I do, I need to take the next step. I won’t bore both of you with the details–and there aren’t many yet. But fall is shaking me up–in a good way now (even though the back pain episode that elicited last week’s lament is still with me)–and we’ll see where this leads. The possibility of “preaching” on stewardship from the pulpit of a Unitarian church and the notion of teaching classes in nature writing both came up in conversation yesterday. Interesting! The photo-notecards (what’s left of my dwindling stock) sold well, so maybe I need to consider ramping that back up again, with a few new sets over the winter? And just before leaving Mt. Lake Hotel, I ran upstairs to get a newspaper (the Roanoke Times published my op-ed piece!) and somebody called my name. It was Leonard Atkins, author of many books related to the Appalachian Trail. He was conducting a several-day-long “class” for an “*elderhostel” group that included field trips to explore local natural history. Now there’s something different. Wonder if I might do that? What a fortuitous crossing of paths. The future is full of possibilities! *It’s not just ME changing. Elderhostel has changed its name (and its target participants) recently–twice, actually–and is now called the Road Scholar program. Check it out. I had really expected that prizes would be awarded from a hundred or more entries in this year’s photography competition for the Floyd County Harvest Festival. Lord knows, there is a large and active photography club here, made up of members in at least two counties, and you can find photographers under every rock, including more than a few professional-level shooters. So to have such a weak turn-out was disappointing, and it made judging difficult and awkward. In the eight (?) categories each with adult and youth levels, there were only three third place ribbons; in others, there were only one or two entries. If only one, regardless of merit, should the judges give a first place? If the choice was between only two in the category, were they required to award a second prize by default to an image that was not a prize winner in the combined judgment of the three judges, each of whom was a photographer of some experience and knowledge? When the prizes had been conferred in this manner, a conversation ensued (ostensibly to be continued over beer, but Dogtown Roadhouse, like the rest of town, was a bee swarm of humanity last Friday night!) about what could be done, should be done to increase the number and quality of next year’s entries. More was said of quality than quantity, having just critiqued quite a few images that, with some simple and basic alterations, would have benefitted so much from an artistic point of view. So next year, what? More advanced notice to area photographers; a significant best-in-show prize; and/or a short course or other teaching tool to help those who want to improve their images’ composition, lighting, color and contrast to be able to do that without professional tools? Poor composition was perhaps the chief poverty noted among many of the submitted images. There was no object to draw the eye towards the message of the image; shots taken at mid-day were flat and lacked depth; nice compositions of butterflies (there were LOTS of fritillaries featured in this year’s entries) were marred by blobs of distracting, not quite out-of-focus, busy background light. I know as a young photographer long ago, I took hundreds if not thousands of “bad pictures” that were cherished images for me because of the setting and personal experience of being there with camera in hand. Having taken the image, I could see, feel and remember beyond the frame. But the resulting images to anyone but me were unremarkable and not very interesting, leaving the viewer’s eye wandering in search of the story. I enjoyed the exchange with my fellow judges when there were relative merits that recommended one image over its competition. And I agonized with them when awarding a prize to a point-and-shoot photograph just because it was there on the display rack. We certainly didn’t want to discourage participation from photographers at all levels, and can maybe, with some early organization and effort, work toward a higher awareness of what makes an image speak the thousand words it should and could. 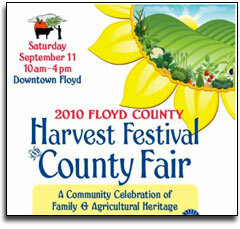 Along these lines, stay tuned very soon for details of a “first annual” photography competition and exhibition in Floyd.